Synopsis : Ms. Walsh told Peg that if she picked her small service dog up she would be forced out of the theater..
Peg Meerkatz, President of Esperanza Enterprises in Long Beach, New York recently endured some highly unfortunate treatment at the hands of an over-enthusiastic theater manager. Service Dog - A type of assistance dog specifically trained to help people who have disabilities including visual difficulties, hearing impairments, mental illness, seizures, diabetes, Autism, and more. In the United States, the Code of Federal Regulations for the Americans with Disabilities Act which took effect as of March 15, 2011 defines a service animal as "any dog that is individually trained to do work or perform tasks for the benefit of an individual with a disability, including a physical, sensory, psychiatric, intellectual, or other mental disability. Peg's company has the goal of improving the lives of people with disabilities while decreasing the number of disabled and chronically ill adults under the age of 65 who are forced into institutionalized care because their needs cannot be met in their own communities. Peg is extremely upset with the treatment she received at this particular theater because of the manager - one, 'Ms. Walsh,' who took it upon herself to essentially deny Peg of the services of her service dog while harassing her through the use of security personnel. Peg had purchased a ticket for NYCB Theater in Westbury, formally referred to as, 'Westbury Music Fair,' in order to see Peter & Paul who used to be Peter, Paul & Mary. She had been to this theater before without any trouble and enjoyed herself immensely. Unfortunately, this time turned out to be very different. She paid a considerable amount of money for the ticket. When Peg went to the theater she was greeted at the front door by a security guard who demanded, 'certification papers,' for her service dog. As anyone who has a service dog knows - there are no such thing as certification papers for a service dog. Peg asked to speak with the manager and was faced by a rather surly young woman who (wouldn't you know it) just happened to be standing by and watching. Peg explained to this young manager that the United States does not certify service dogs. Ms. Walsh, the theater manager, followed Peg to her seat and then rather emphatically stated that her service dog must remain on the floor at all times. Ms. Walsh told Peg that if she picked her small service dog up she would be forced out of the theater! The floor of the theater itself was cold and filthy, so Peg took off the jacket that she wore to protect her from the air conditioner and placed it on the floor for her service dog. The theater manager was not to satisfied - Ms. Walsh assigned security personnel to sit right behind Peg for the duration of the show to ensure that she obeyed Ms. Walsh's very important rule. The security personnel assigned to watch Peg talked among themselves and made it extremely difficult to enjoy the show for Peg. During the break time Peg was not permitted to exit the theater to go to her van where she had a small blanket for her service dog; instead she was directed to a small courtyard where smokers were. During this break Peg saw Ms. Walsh and told her that she had another ticket to see a show the following month but because of her experiences during this show she did not know if she wanted to attend. Peg decided she did not want to miss the coming show; she did not call Ms. Walsh for a refund. The more she thought about it, the more she knew she wanted to see the show the following month, which featured Don McClean and Judy Collins. Instead, She chose to research everything she could find concerning laws about service dogs and was unable to find a single thing stating that small service dogs having to remain on the floor. Peg printed out some general laws concerning service dogs and included them in a heartfelt letter to Ms. Walsh the NYCB theater manager. In her letter to Ms. Walsh, Peg explained the important job that her service dog performs as well as the significant role her dog has in her life. She told Ms. Walsh that she was seated in an open area, in the very back row. To the right was the light operations booth - there were no seats for people. At least 20 rows in front of Peg at the concert were completely unoccupied and there was no food present anywhere near where she was seated. Peg made a plea with Ms. Walsh to permit her to attend the show the following month without incident - meaning that she did not want any security personnel talking among themselves assigned to watch her, as well as the ability to have her service dog sitting on her lap if she wished. Her service dog is there as much for Peg's physical comfort as it is for her emotional comfort. Her service dog's main training is as a Diabetic service dog, yet she also provides Peg with a tremendous amount of emotional comfort. Peg lived through Hurricane Sandy and experienced a number of serious losses, nearly losing her service dog as well. Her service dog is exceptionally well-trained and behaves. As a service dog, Esperanza is very aware of when it is time to work and when it alright to just be a dog. She has the ability to adjust very quickly from being a dog to being a service dog. Esperanza has a great amount of love and respect for Peg and vice-versa. "Talk turned to puppies when a child gave Peter a stuffed dog. He was playing with it & talking to it like a real dog. From my 2nd row seat I called to Peter, 'do you like real dogs' He said that he loved them but added there were none here. I said there was. I was unable to get on the stage because of my walker but I brought Esperanza to the stage put on her flexi leash & told her to go give Peter kisses - she did and stole the show. When instructed she returned to me & we went back to our 2nd row seats & she sat on my lap for the rest of the show." Yet the new manager of NYCB theater, Ms. Walsh, insists that Esperanza the service dog cannot be on Peg's lap at the theater - even though Ms. Walsh is unable to provide documentation to prove her assertion. Peg's impression is that Ms. Walsh is being difficult simply because she can be, and I agree. Ms. Walsh is guilty of disability harassment, as well as denying a person with disabilities the services of her service dog. In my opinion, Ms. Walsh has abused her authority as a theater manager and should be fired. 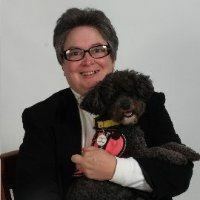 Peg is asking people who support her position, no matter how near or far away they live, to call Kate Walsh at: (516) 247-5208 and leave a message telling Ms. Walsh that small service dogs who are under control are ok on their owners laps and will not interfere with the operation of the theater. People with disabilities are America's largest minority population. If theaters such as the NYCB want to make money, it is time for them to accept and understand that we are a part of the population that attends theaters, complete with our service dogs. Continued hateful and prejudicial treatment of people with disabilities in America is completely unacceptable, and Peg's experience is a prime example of just how nasty some young and inexperienced theater managers can be when they feel as if they have some level of authority. Ms. Walsh desperately needs to learn a lesson in regards to interactions with people who experience forms of disabilities. We focus on Disability Empowerment and Inclusion providing not just informational services for people with disabilities and their caregivers but an adult day medical, recreational and social program for disabled and chronically ill adults age 18 to 64. Is the theatre handicap/ADA accessible? Yes, please call (516) 334-0800 for further information.